Please refer to our stock # 738 when inquiring. 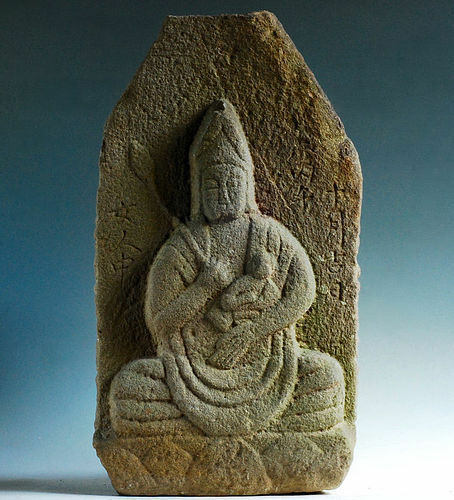 Seated Koyasu Kannon Bosatsu, the right hand holding a long-stemmed lotus bud and the left arm supporting an infant child, sculpted in relief from a light-brown sedimentary stone. Mid-Edo Period ca. 1700. Minor old loss. An uncommon depiction of Koyasu Kannon Bosatsu, deaccessioned from a municipal art museum located in the Tohoku region north of Tokyo. Highly collectible.